A number of years ago, I made a very minor linguistic discovery concerning the geographical distribution of a certain idiom. The phrase in question is “to cut the cheese”, a somewhat colourful description of flatulence that was quite common in the parlance of the young people of North West Kent in the mid 1990s (of whom I was one). My discovery was that this same phrase was also current in Sussex about 10 years later, but evidently not (or at least not very widely known) in either North or South Wales. Admittedly my research was confined to the group of three friends with whom I was having lunch on one occasion when there was an opportunity to make a joke about cutting the cheese, which only one of them understood. The reason I mention this now is that I was watching an episode of Bones a few days ago and a couple of the characters in that amused themselves with a reference to cutting the cheese, clearly in the same context. The episode was from around 2008 or so, and was set in Washington DC. I assume that the scriptwriters were from somewhere in the USA, not necessarily the DC area, so it doesn’t allow for the particularly precise location of another time and place (other than Kent c. 1993 and Sussex c. 2003) where the phrase had currency. Still, it was interesting to discover that its not a purely British idiom. I wonder whether it travelled from South East England to the eastern seaboard of the United States or vice versa, somehow bypassing Wales on the way, or if it reached both places via other paths. While I’m on the subject of cheese, I should perhaps mention a surprisingly nice taste combination I stumbled upon a year or two back and still enjoy as a snack from time to time mdash; cheddar cheese and wasabi paste. Okay, so the title is probably exaggerating slightly (and yes, in case you were wondering, it is somewhat inspired by Dirk Gently’s Holistic Detective Agency), but I noticed just after I posted yesterday that it was my second consecutive post to feature the word “sweet” in the title. Not only was the last post connected by its title to the post before it, but it was connected thematically (albeit loosely) to the post before that because they were both more or less about cheese (mascarpone – one of the major ingredients of my newly discovered pasta sauce – being a type of Italian cream cheese). I’m sure if I didn’t have better things to do with my time I could probably discover a connection between tomatoes and Welsh grannies or Navajo rugs too! There are some questions I don’t recall ever asking myself but when I hear an answer for them I get the feeling that the question has always been floating around somewhere in the back of my subconscious. One such question is why Swiss cheese has holes. I’m fairly sure it’s not a subject I’ve ever particularly thought about until today when I came across an article on the BBC news website about some research that gives an answer to that very question. In case the link to that article should become invalid within the lifetime of this post, I’ll repeat the answer here. A group of Swiss scientists believe that the holes are caused by microscopic particles of hay that get into the milk during the milking process. Only some Swiss cheeses, such as Emmenthal (one of my favourite cheeses, incidentally), are affected by this phenomenon and apparently such cheeses have been coming out with fewer holes over the past few years, which is believed to be due to changes in milking techniques that lead to less hay contamination in the milk. The research was done by adding small amounts of hay dust to milk before turning it into cheese, so I suppose that if a traditional hole-filled cheese was wanted without reverting to traditional milking techniques they could probably add some hay dust to their milk for production purposes. The article noted that this research has not been peer reviewed, which indicates that it’s not yet quite ready to be considered a scientific fact. As quite often happens, the answer to one question brings forth several new questions. The ones that immediately spring to my mind are whether the same explanation would hold for non-Swiss cheeses with holes (such as Jarlsberg – another of my favourite cheeses, this one from Norway), why only relatively few varieties of cheese seem to experience this phenomenon given that hay contamination of milk must presumably be fairly common with traditional milking techniques (presumably there’s something about the cheese recipes that make them more or less susceptible to it) and whether you could get some interesting results by introducing hay particles (or other things) to other cheeses. Also, the research indicated that the holes are caused by hay particles but didn’t seem to offer an explanation for the mechanism by which this works; this would seem to be an obvious follow-up question. Not that long ago, I wrote about a particularly nice variety of Lancashire cheese I’d discovered called Bowland, that is stuffed full of fruit and spices and resembles a slice of cake. I also mentioned the general affinity of certain types of cheese for fruitcake. Staying with a Lancashire gastronomic theme, I’ve recently discovered another fine cheese / cake pairing. The other day I found that my local supermarket was selling packs of Chorley cakes, which are similar to the better-known (and geographically fairly close) Eccles cakes but made with shortcrust instead of puff pastry and generally less sweetened. I’ve long been partial to Eccles cakes but didn’t recall trying Chorley cakes before, so naturally I had to rectify this gap in my education. On returning home with my newly purchased comestibles, I did some research on Wikipedia (linked above) and discovered that Chorley cakes are often served with a bit of butter spread on top and accompanied by a bit of Lancashire cheese. As it happens, I’d bought a block of that in the same shopping trip (just the plain variety this time, not Bowland) and so I was able to try Chorley cakes in an authentic manner and discovered it to be a fine combination (apparently Eccles cakes are also often served with Lancashire cheese, though I haven’t yet had a chance to test this partnership). Having tried some commercially produced Chorley cakes and guessing that they would be fairly simple to make, I dug out a recipe for them and had a go at making some this evening. I was moderately pleased with how they turned out (at least the ones I’ve tested so far), although I think my ratio of pastry to filling was a bit too high. The particular recipe I followed instructed to add a bit of baking powder to the pastry, which is (as far as I know, not being a very expert pastry chef) fairly unusual for shortcrust but seems to work quite nicely to make it a bit lighter. 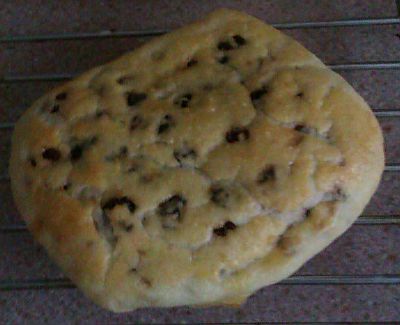 The filling is supposed to be currants with butter and a bit of nutmeg. I didn’t have quite enough currants for the full amount, so I made up the difference using raisins (apparently an authentic Lancashire variation). The currants I did use were the tail end of a bag I got to do some baking several years ago, so they were probably not in the best condition but were still edible (though I probably wouldn’t have used them if I’d been baking for anybody else to eat). The recipe also indicated that sugar was an optional ingredient, so I decided to try without on this occasion. This makes the cakes relatively unsweet, but that’s not necessarily a bad thing. This way they would probably work better with cheese than ones which are sweeter (unfortunately I didn’t have any cheese left to try with this batch) and they would also be reasonably diabetic-friendly (although probably not that healthy as they have a fair amount of butter (or cooking marge, as I used today) in them. The cakes in this recipe were glazed with a bit of beaten egg, which I’m sure contributed to the golden brown finish and also left me with a nice bit of egg to make an omelette for dinner. Another recipe I looked at suggested glazing with milk; I imagine that would give a slightly paler glaze although might work quite well if you didn’t have an egg to hand. I think I will definitely try making Chorley cakes again, although I will try to get a bit more filling in next time (and use slightly less out-of-date currants). I might have a go at Eccles cakes too, if I can nerve myself to try making puff pastry (or decide to wimp out and buy some ready made).